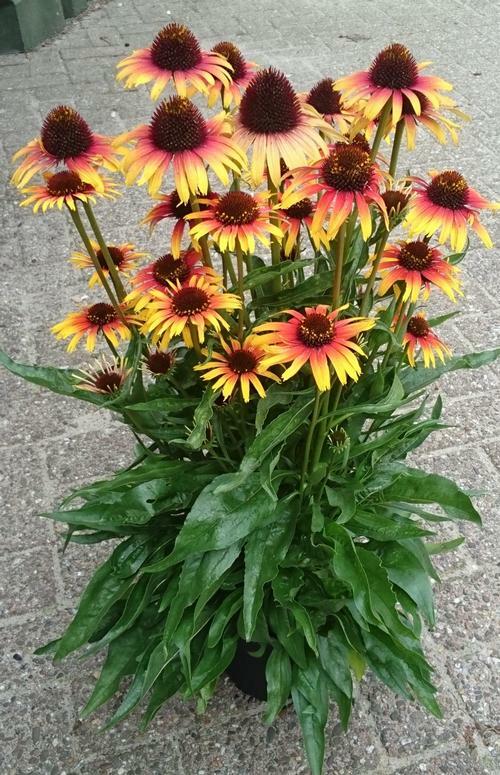 Hybridized by AB Cultivars, this Echinacea is the first variety in the 'Fine Feathered™' series, flowers are unique with bi-color yellow and red blooms on a compact plant. Echinacea (Coneflower) have always been a mainstay in the sunny perennial garden. Their popularity has skyrocketed in recent years due to intensive breeding programs that have produced fatastic new colors and introduced double and semi-double forms. They tolerate of a wide range of conditions, including heat and drought tolerance. Plant in full sun in average soil. Attractive cone heads add winter interest and are good for dried arrangements. Plant: Center in pot and plant crown at or just below the soil surface. If planting plugs, make sure plug trays have been watered prior to transplanting. This will ensure quicker and more even root penetration into the surrounding new soil. If plugs are root bound, loosen the roots in the lower third of the plug prior to transplanting. Grow: Grow in full sun at 55 - 60F minimum night temperatures. After growth appears, fertilize with 200 ppm Nitrogen every 7-10 days. Too much fertilizer can lead to root and crown rots. PGR's: Most commercially available plant growth regulators are effective in controlling plant height. Consult label instructions. Diseases: Mostly susceptible to botrytis, pythium, and aster yellow. Use preventive fungicides and good cultural practices to reduce susceptibility.